Start your vehicle or at minimum have the ignition switch on. 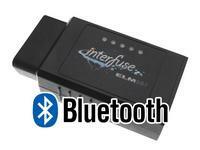 Connect the ELM327 interface to the OBD-II adapter in your vehicle. The OBDII plug is normally located under the steering column or dash board, about 3 feet away from the driver. Turn on your computer locate the Bluetooth settings. In Windows you may have a Bluetooth icon in your task bar tray, you can click that. Scan for and locate new hardware. It may show up as 00:13:EF:00:0A:69 or similar but will resolve to OBD-II. If scan results come up empty, unplug the interface and plug it back in and be sure you in transmission range of the Bluetooth signal. If the trouble persists try connecting in a different vehicle. After the OBD-II Interface has been located pair it using the code “1234” or “6789”. The drivers will begin to install, if not, make sure you are connected to the internet and that Windows is allowed to download and update drivers. The drivers are required for operation, if they do not install you may have to manually install them. Install the software package of your choice. Easy OBD-II is a real basic package to begin with however ScanMaster-ELM is more comprehensive and will automatically detect the COM-Port for the Elm which is a plus. Open the software and proceed to connect to your OBD-II diagnostic tool. If the application asks for a COM-Port, select the COM-Port that the device connected; this information can be found in the Device Manager. If you’re not sure which COM-Port to set, you can find it in the Device Manager under the ‘Ports (COM & LPT)’ heading. By disconnecting and reconnecting the device you will be able to see it appear in the manager. If the COM Port is set too high (higher than the software allows), you may proceed by re-assigning it to a lower COM Port from the properties menu. If after changing the COM Port you are unable to connect to the interface but the software recognizes it, you need to reset the device settings by right clicking and un-installing the drivers from the Device Manager and un-pairing the device from the Bluetooth menu. Reconnect the adapter and pair it to your computer to reinstall the drivers. Go Online with your vehicle to begin collecting real-time data and trouble codes from the ECU. The process for each software package will be slightly different but self-explanatory.